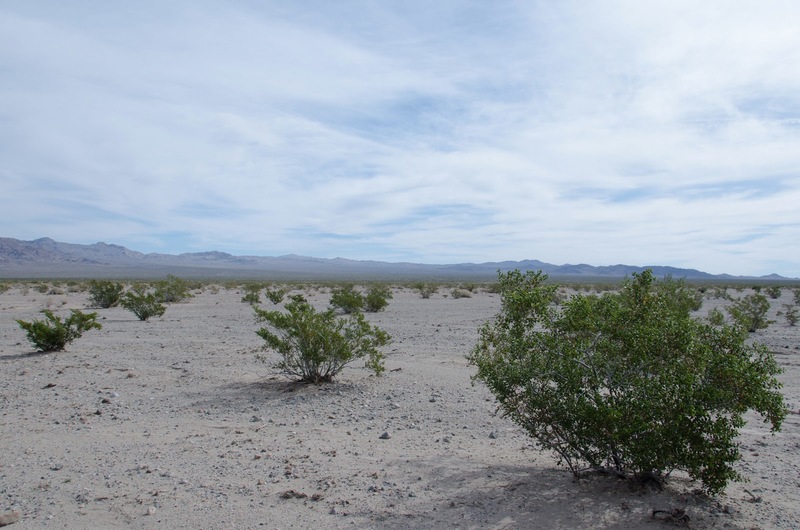 California's desert landscape is a treasure. 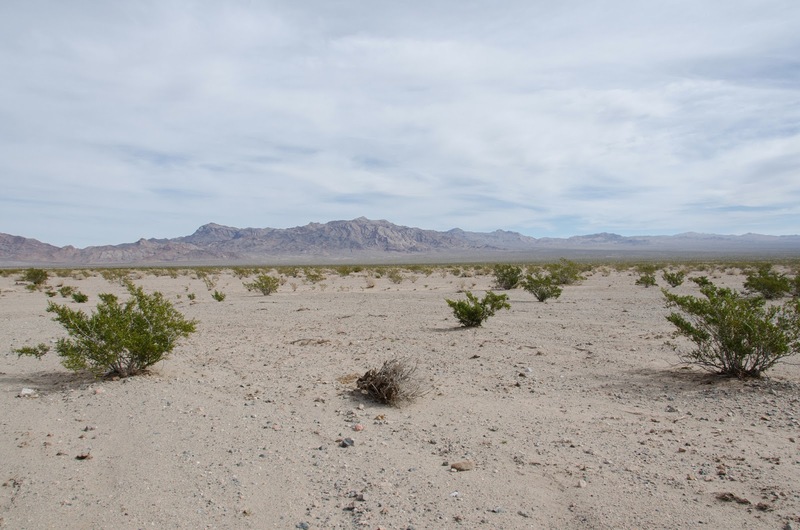 Some people see it as a bore, or a wasteland, but what they cannot deny is that it is a wild landscape that offers a stark break from the strip malls and parking lots of Las Vegas or the Victor Valley. It is not only accessible, but it is expansive -- at least for now. Chris Clarke at KCET wrote a great piece on one very long stretch of road that can give you the full experience of this wild place. 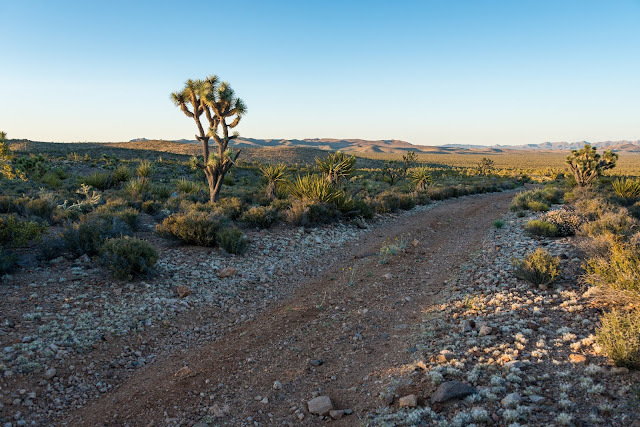 From Joshua Tree National Park to Death Valley National Park, you can traverse nearly 200 miles on a mostly two-lane road and experience the desert. 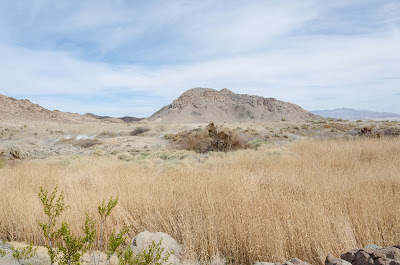 You can start in a Joshua Tree woodland, hike up a mountain where there are juniper and pine, cross sand dunes, and then enjoy the riparian habitat of the Amargosa River at Shoshone. You may cross some high voltage power lines, and a couple small towns (Baker, the largest, has a population of around 700), but you will mostly find solitude. Especially if you stop, get out, and walk. I think one of my favorite experiences along this route occurs just after you leave Baker, heading north. You drive along the eastern edge of Silver Lake - a lake bed that is dry unless it has just rained. 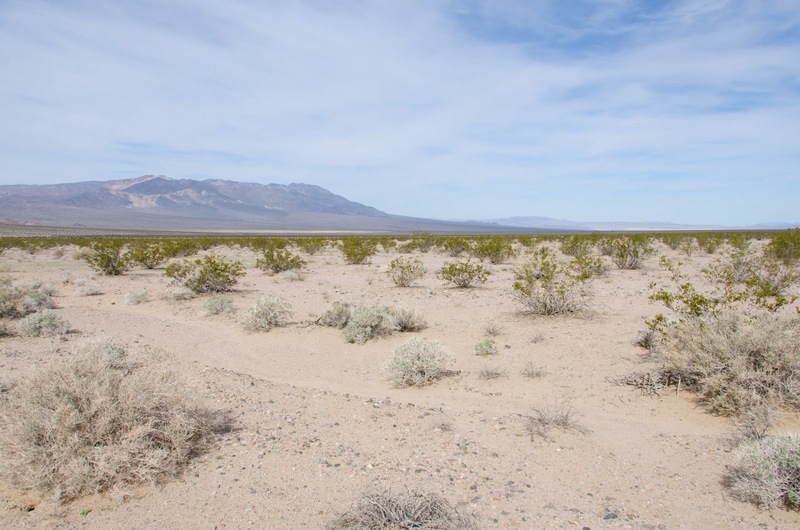 Silver Lake's flat expanse was used as an emergency airstrip in the early days of aviation, when the thought of flying across the Mojave without a trusted back-up plan was unthinkable. Continuing north you gain a little bit of elevation before you follow a bend over a small hill. This is my favorite part -- the open expanse of the Silurian Valley greets you as you crest that hill. The relatively humble Silurian Hills to the east, on the other side of a very gently sloping sea of creosote bushes. To the west is an imposing sight -- the Avawatz Mountains rise to nearly four thousand feet in dramatic fashion, seemingly at a stand-off with the Silurian Hills, or perhaps trying to gaze at the majestic Clark Mountain in the distance. 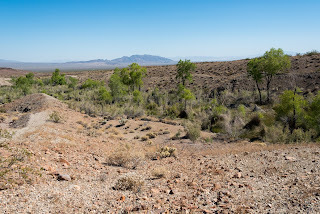 Near a faint wash in the Silurian Valley, looking north with the Avawatz Mountains in the distance. Further north is Death Valley, and Dumont Dunes. Not pictured, but to the right (east) in this image are the Silurian Hills, and Clark Mountain. On my last trip to Shoshone I got to walk around the Silurian Valley, crossing numerous washes that braid through this landscape; as elusive as rain can be in the desert, it leaves its own mark. On this trip in February, the green buds of wildflowers and grasses were apparent, but too early for blooms. Tracks of rodents and lizards were numerous. But I had a hard time studying the animal tracks. The view was too beautiful. I knew that in due time I would be back in the city, surrounded by advertisements and traffic. In the middle of the Silurian Valley I could look north toward Death Valley and imagine walking for miles marveling at the little surprises of desert wildlife, and experiencing that combination of loneliness and release as I looked up at the naked topography ahead of me. With the Avawatz Mountains behind me, I could take this photo of the less dramatic (but still beautiful) Silurian Hills to the east. We camped the night before at the foot of Clark Mountain, which would be a good hike to the east of the Silurian Hills, but almost certainly visible from the top of the Avawatz. 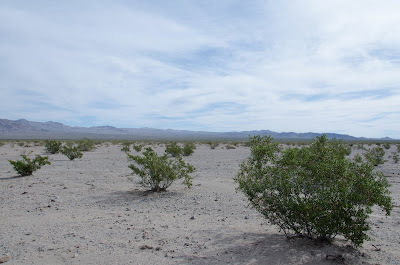 I took my friend Jimmy to the Silurian Valley on our way to Death Valley. I showed him the meteorological testing tower installed by Iberdrola Renewables, and told him about the plans to build a large wind and solar facility in the valley. From where we stood at the testing tower, I pointed to a seemingly distant point where the hills reach into the valley. The entire desert from where we stood to that point would be bulldozed or mowed for the solar facility. Beyond that, dozens of giant wind turbines would dwarf the Silurian Hills, and turn this majestic landscape into another industrial zone, as if you could never escape our own destructive habits. Looking approximately southeast from the northern portion of the Silurian Valley, this entire experience will be lost if Iberdrola builds its wind and solar facility. Instead of an open expanse, you will see another profit making venture scarring public lands. We traveled further north crossing Riggs Wash to the Salt Creek Hills Area of Critical Environmental Concern (ACEC) not far from where the Iberdrola project would be built. The ACEC is a rare point in the desert's landscape where all of the water it hordes underground escapes briefly, to the joy of birds and plants. 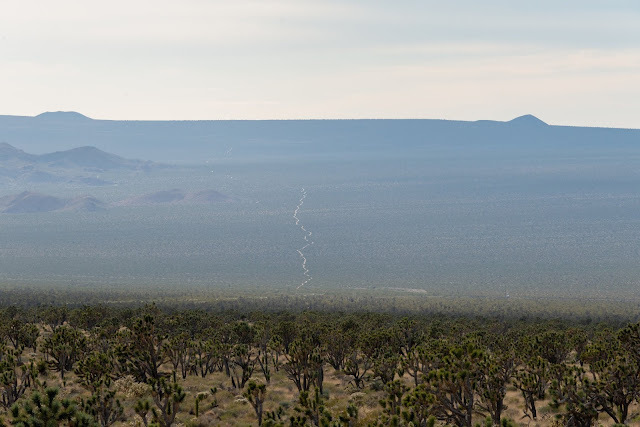 Here we were about 100 miles from Las Vegas, and over 200 miles from Los Angeles, and we found the company of others distracted by the desert's peace. A couple with a dog. A younger group that seemed to be travelling together. And a mother with her two young boys that made their way down the short trail to the creek ahead of us, one of them dragging a toy car over the boulders. The kids were distracted by the water that came into view, perhaps amazed at its presence here in the desert. Hidden by all of the plant life is the water of the Salt Creek Hills ACEC. I thought to myself how lucky those kids were. The desert before them was an adventure full of surprises. Rocks, lizards, water, plants...all of it. I thought how lucky I was. I grew up in Victorville and the best playground of my life was among the creosote and Joshua trees, but I took all of that for granted. The desert that I called my backyard is gone now. It's a housing development. Three car garages and green lawns. But that day in the Silurian Valley I could reclaim that amazement. I could be in this challenging landscape, fortunate enough to survive and enjoy its beauty, and store all of the solitude and peace I could gather. It might be a while before I make my wake back to Silurian Valley, but I hope I can still find an escape there. I am floored, moved, and saddened to read your beautiful "Ode to Silurian Valley." How many, many times I've driven through this sacred land...on trips to Tecopa Hot Springs; on trips to Death Valley; at night beneath hard-to-believe, blazing star-shine, full of warm soak; and on sultry mornings; in summer thunderstorms and past a Silurian Valley with rich wet creosote scent, and a Silurian Valley filled with timeless silence and imaginings. Thank you for this wonderful piece, and a huge NO to windmills and solar projects in Silurian Valley and all of the other pristine, and oh-so-necessary-for-the-human-spirit and health of our planet places like this! !